FTIR stands for Fourier Transform Infrared spectroscopy. It is a powerful gas measurement technology for simultaneous measurements of multiple gases. The ability to detect and measure almost any gas, combined with the robustness and reliability of the technology, makes FTIR ideal for a wide variety of applications. All molecules can be identified by their characteristic absorption spectrum because each molecule absorbs infrared radiation at its characteristic frequencies. Every molecular structure has a unique combination of atoms, and therefore produces a unique spectrum when exposed to infrared light. Even molecules with the same number of atoms in different positions can be distinguished. The only exceptions are diatomic elements such as O2 and noble gases, which do not absorb in the IR. IR absorption spectrum can be thought of as a fingerprint unique to each molecule. The infrared spectrum is a plot of infrared radiation related quantities as a function of wavelength or wavenumber. According to Beer’s law the absorption strength (peak height) is directly proportional to concentration, and this way the IR spectrum can be used to determine concentrations of gases in the sample. Non-Dispersive IR instruments (NDIR) measure only separate wavelength bands, no information from other parts of the spectrum. Only one component can be analyzed from a single measurement and interference cannot be compensated. Fourier Transform Infrared (FTIR) spectrometer measures all the IR wavelengths simultaneously and produces a full spectrum. All components can be analyzed from single measurement and interferences are resolved. 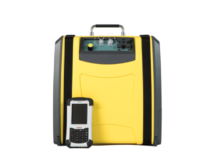 Gasmet manufactures portable FTIR gas analyzers and stationary FTIR emissions monitoring systems. An FTIR analyzer works by simultaneously scanning entire infrared spectrum. Then, the software calculates the concentrations of each gas in the sample based on the characteristic absorption. All the gases in the sample can be measured simultaneously because the entire infrared spectrum is scanned at once. This allows for very quick multicomponent measurements and for compensation for any cross-interference. As all gases are measured by scanning the same infrared spectrum, adding new compounds can be done easily in the software without requiring any changes to the hardware. The recorded spectra are also unaltered by the analysis performed on them and can therefore always be re-analyzed. This allows for traceable data and facilitates for instance retrospectively checking the measurements for new gases. All this makes FTIR the ideal solution for a variety of applications where multiple gases need to be measured quickly, accurately and reliably.